This post contains affiliate and consultant links. Y’all know how much I love making my own cleaning and beauty supplies, right? Well, this one has been on my list for a while, and I finally tried it out! I’m sooo happy that I did, and was so excited about the outcome that I cannot wait to make more! Okay…so, I have a slight EOS obsession. Seriously, those little balls of lip balm can be found in my purse, car, bathrooms and even by my kitchen sink. I think the thing that makes them so fun is the container. 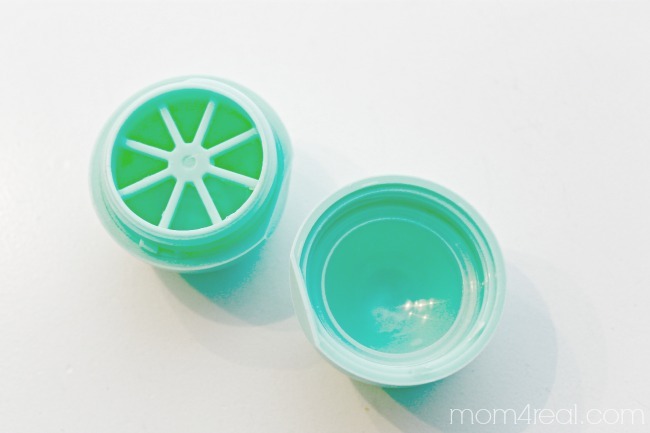 So, when I got to the end of my last peppermint EOS, I thought…what a shame to throw this cute little container away…I wonder if I can make my own refill. Well, folks, the answer is YES! 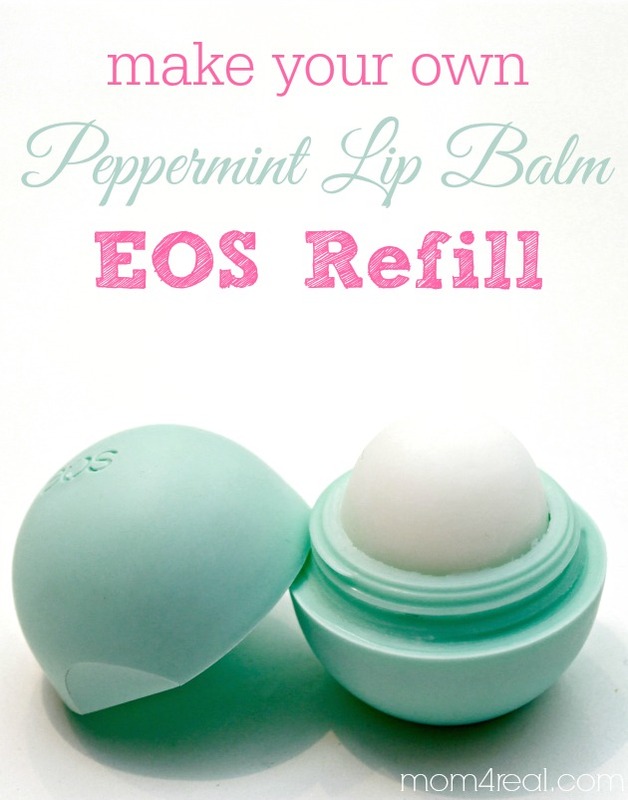 You can make your own Homemade Peppermint Lip Balm EOS Refill! Whoop! Start by submerging your empty EOS container in a pot of boiling water to remove any germs and remove the remaining chapstick. In a double boiler or microwave safe bowl, combine 2 Tablespoons of Beeswax Pellets, 4 Tablespoons of Coconut Oil and 1/2 Teaspoon of Vitamin E Oil. If you are using a double boiler, put ingredients in top bowl and boil water below until mixture is melted. If using a microwave, cook for one minute, then 30 more seconds until mixture is fully melted. Once melted, add 10 drops of Peppermint Essential Oils and stir together. 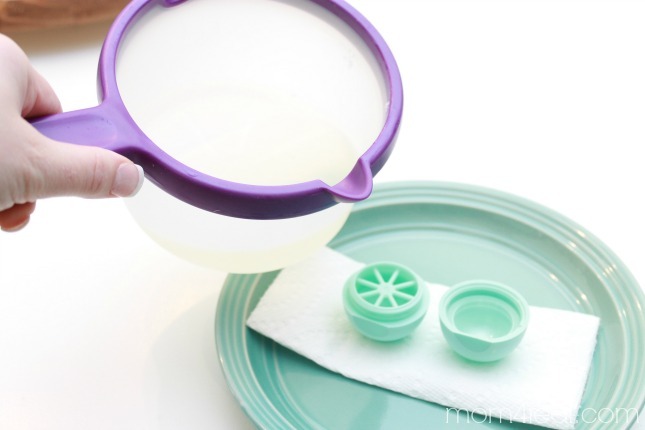 Pour mixture into the rounded part of the EOS container. Fill to the top edge of the top of the container. It’s totally ok if it overflows a bit! Screw the bottom onto the top keeping it facing down, then place in your refrigerator and leave for a few hours. Take the container out of the refrigerator and unscrew. 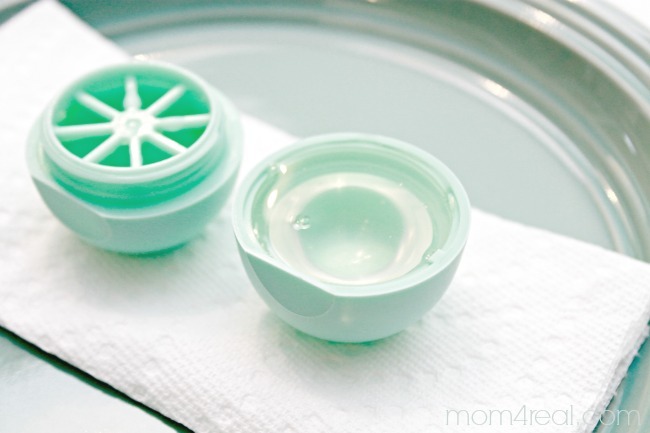 Remove any excess lip balm using a paper towel. I am not even kidding when I tell you that this stuff is even better than the original! It’s soft and tastes delicious…not that you really want to eat it or anything. But…it’s totally safe, and the coconut oil make your lifts so soft! We use this mixture in chapstick tubes to help heal chapped skin as well…you know, that area around your nose that gets dry after a cold? Well, the coconut oil in this chapstick moisturizes the chapped skin while the Peppermint Oil helps remove the redness! Even Kate loves it, which is a miracle, since it’s homemade and not store bought! It’s so easy to make your own EOS Refills and I can’t wait to experiment with some of my other essential oils…maybe a lemon lipbalm will be next! I guess I’m “out of the loop,” how do you acquire “EOS” to begin with? I would love to make my own lip balm, but need the plastic “thingie” to start with! Thanks. They are a brand of lip balm found in most stores…Target, Walmart, Meijer, Walgreens…just about anywhere. I love them! When mine ran out, I just decided to try and refill it. Hope this helps! Hi there! I tried this today. Pouring the lip gloss in the rounded side of the container. But it just staying up there (stuck up in the lid). How did you get it out of that part of the lid and sitting on the grid side (if that makes sense). Hi, Correne! Try putting it in the freezer upside down for about an hour. 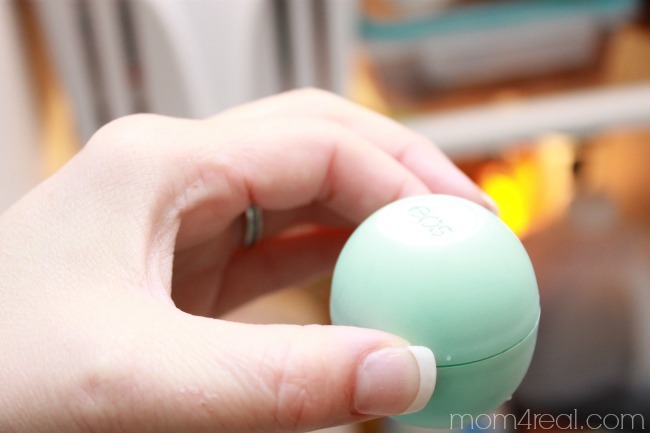 When you take it out, open it up, then push lightly on the lip balm, releasing it from the top. Lightly place it on the bottom half and push it down a bit. It should stay in place. I had to do this with one of mine, but only once. I assume this recipe would work in any chapstick container right!? Like the tubes? Did you know that you can actually pop out the “pizza” looking thing? I use the backside of tweezers to pop it out from the bottom. Then screw it into the top part, leaving the bottom separate. Then when you fill the top you cover that middle piece. Let it harden upside down. Snap the bottom on to the top. Then you unscrew it as you normally would and you should have the nice rounded shape attached to the bottom. Just another suggestion! I had no idea! Thanks so much for sharing…definitely going to do this next time! How many lip balms does that recipe make? I did it last night and filled 10 with the above recipe. They turned out beautifully!! Can you use a bit of Saran Wrap inside the lid first before pouring in the liquid and let it freeze that way? That’s not a bad idea…will have to try it next time! This is so awsome my lips is so beutyfull??????? ?